We’re getting very excited for the First Assembly here in Áiseanna Tacaíochta (ÁT), and really hope to see you in the International Arena in Athlone on Saturday, 13th June. If you’re getting ready to register your free tickets for the day, here’s some of the practical information that might help you with your plans for getting to Athlone. Registration is simple – and, even better, it’s free! It takes just two minutes to book your place; just click here to visit our Eventbrite booking platform or use the ticket form at the bottom of this page. Once you’ve completed the short form, your tickets will be e-mailed straight to you. If you would like some further support in registering your place, just give our Communications Officer, Orlaith Grehan, a quick call on 086 183 1502, or e-mail orlaith@theatnetwork.com with any questions or requests that you have. Registration remains open until 5pm on Friday, 5th June 2o15. 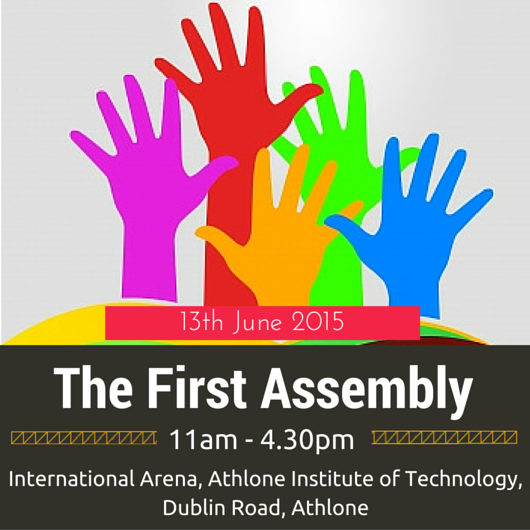 The First Assembly is taking place between 11am and 4.30pm in the International Arena in the Athlone Institute of Technology (AIT) on Saturday, 13th June. Athlone is the most central town in Ireland. AIT is based on the Dublin Road in Athlone. It is approximately a ten-minute drive from the main town. A map to the campus, which lies on the east side of the town, is available by clicking here. If you require more information about getting to the AIT campus, you can call the college on 090 646 8000 or, alternatively, the town’s Tourist Office on 090 649 4630. Athlone sits on the M6 motorway, which, along with the M4, runs from Dublin to Galway. You can plan your route from your own location through Google Maps: click here to find out more. Free parking is available in the AIT campus throughout the day of the event, with close to 700 spaces for private cars and buses. Bus Éireann operates a number of routes through the town; more information and timetables can be found by clicking here. Irish Rail services between Dublin and Galway, Dublin and Westport, and Dublin and Ballina also stop in the town; more information and timetables can be accessed by clicking here. AIT is approximately a ten-minute drive from the bus and train stations in Athlone. If you would like to arrange a taxi service between the AIT campus and either station, a list of taxi companies in the area is available by clicking here, while wheelchair-accessible taxi drivers in the area can be contacted and booked by clicking here. We do all that we can to ensure that any event we hold is open and accessible to everyone. Both the Food Court and the International Arena in AIT are wheelchair accessible, and accessible bathrooms are available. We will have a significant number of sign language interpreters available throughout the day. Health and Safety personnel and stewards will also be available to guide and direct people to the various areas of the venue and to support people if they experience any difficulties. If you have any access requirements that you would like to enquire about, please contact Orlaith Grehan by calling 086 183 1502 or by e-mailing orlaith@theatnetwork.com. Yes! We’re kicking the day off by gathering in the Food Court of AIT at 11am, where there will be tea, coffee and refreshments available to purchase. Lunch will also be available during our afternoon break , at an average cost of €8 per person. For Health and Safety purposes, no food or drink is allowed into the International Arena itself during the event. Is there accommodation available in Athlone? Just complete the form below to get your free tickets to the First Assembly!